The latest Judy Malware infected up to 36.4 million user devices. Check point found greater than 41 apps in Google Play Store due to which Android malware spread out. Most of the person facing lot of issue due to Judy Malware and then want to know how to check and keep safe his Android device. Judy Malware is an auto clicking adware which is used to make money for his developer when they clicks online advertisement. This malware is developed by the Kiniwini Korean company which is registered with the name of ENISTUDIO Corp. This app quickly spread out when you try to download any infected app from Google Play Store. The check point research has identify 41 apps which is infected with this app. If you have any one of them at your device then remove them immediately. To keep safe your device you must have to know how to increase Android smartphone security. If your Android device effected with Judy malware then you must have to take few simple steps to keep safe your device. Normally Google Play Store has it’s own check points to search the malicious apps. But any malware missed out then it will be deducted with the help of Antivirus. So, you must have to install or update Antivirus at your Android device. You can also read different important tips which helps you to know how to secure Android phone with different attacks. You will get lot of updates of your device or apps in regular interval. Each update bring latest features which is useful for us. You have to update your device when you get the update information of your device. If you have any infected apps which is given in Google Play Store infected apps list with malware. Then you must have to check and quickly remove those apps from your device. During installing or remove the apps few common security mistakes done by Android phone users which lack your phone security. You must have to avoid these mistakes which is harmful for your device or data privacy. If you want to download any app from Google Play Store then first you must have to check the app permissions. If you feel any app want to get rights when is harmful for your phone security then you have to refuse then permission. You can also avoid to download these types of apps for your Android device. 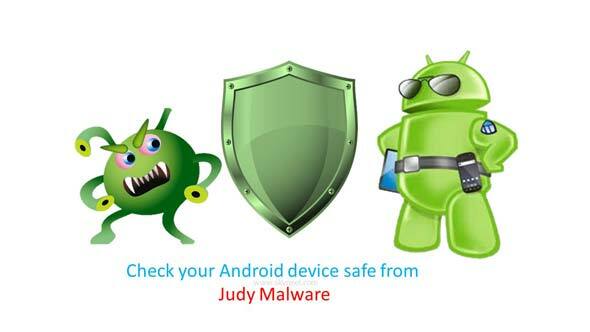 As per conclusion if you want to keep safe your Android device with Judy malware then avoid to install infected apps. You have to read all the given important points which helps you to keep safe your device.